See the Latest Products & Services at the STC Exhibitor Showcase! The STC Exhibitor Showcase is held at every STC spring and fall membership meeting. 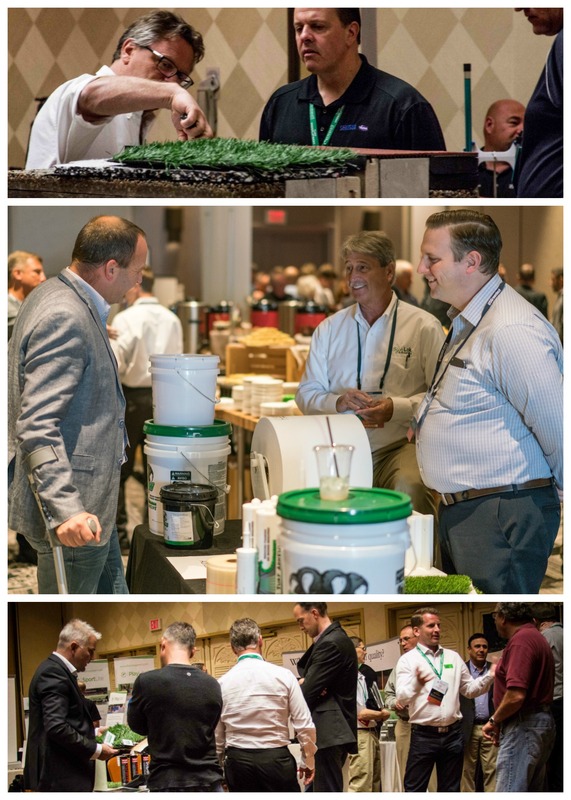 The STC Annual Membership Meeting provides networking and education to the synthetic turf industry, offers a forum to exchange current information on industry-related issues, and promotes effective communication between builders, landscape architects, testing labs, maintenance providers, manufacturers, suppliers, installation contractors, infill material suppliers and other specialty service companies. All coffee and refreshment breaks will be located in the Exhibit Hall on Tuesday, March 12. Setup is on Monday, March 11 from 8:00 a.m. to 5:00 p.m.
Breakdown is on Tuesday, March 12 from 5:00 p.m. – 6:00 p.m.
Standard 120V electrical outlets are available in certain areas of the ballroom. If you require use of an outlet, please send us your request and bring an extension cord and power strip. Exhibit shall be fully responsible to pay for any and all damages to property owned by Hotel, its owners or managers which result from any negligent act of omission of Exhibitor. Exhibitor agrees to defend, indemnify and hold harmless, Hotel, its owners, managers, officers or directors, agents, employees, subsidiaries and affiliates, from any damages or charges resulting from Exhibitor's use of the property. Exhibitor's liability shall include all losses, costs, damages, or expenses arising from, out of, or by reason of any accident or bodily injury or other occurrences to any person or persons, including the Exhibitor, its agents, employees, and business invites which arise from or out of the Exhibitors occupancy and use of the exhibition premises, the Hotel or any part thereof. For questions, please email office@syntheticturfcouncil.org or contact Maria Donovan, Member Services Coordinator - maria@syntheticturfcouncil.org - 443-640-1067 ext. 1137 or Melanie Taylor, Associate Director - melanie@syntheticturfcouncil.org - 443-640-1067 ext.1142.